Click the thumbnail for the photo. 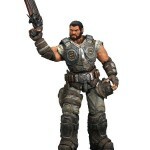 NECA has posted pics and info for their upcoming Gears of War 3 Series 3 7″ Action Figures. You know the deal by now. Hell, our Gears of War figures are practically an institution at this point. Marcus Fenix and company are back in action against the Locust Horde to close out the war once and for all, and after the excellence that came with our Series 1 and Series 2 figures for the game, we decided to make it a trilogy of our own. The result is Gears of War 3 Series 3, which is our most detailed and biggest series yet! Marcus Fenix returns after leading off the first series. This time, he’s out of his armor with a gold Lancer (have you seen our Retro Lancer replica? It’s awesome) for a figure we’ve called Journey’s End, and is joined by a COG soldier and two versions of the Savage Theron, which come complete with Butcher Cleavers, just like in the game. 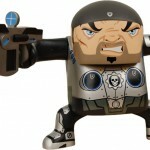 These Savage Therons are the first Locust figures in the Gears 3 line, so make sure you don’t miss out! As always, we’ve crammed as much articulation as possible into these new sculpts, including an ab crunch, pectoral movement and double elbows. Marcus and the COG Soldier have over 30 points of articulation, and somehow they still came out totally accurate to the game and each character’s unique look. So while the complex storyline of the Gears of War trilogy meets its end, we’re right where we’ve been the whole time: Bringing you all the best in goods from the game. Don’t forget to grab a Dom figure from Series 2 to go with your new Marcus, and don’t forget to check out our San Diego Comic-Con exclusive Elite Theron. 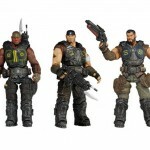 Neca announces new Gears of War Batsu figures. Sure, we’ve got our regular Gears of War figures and they’re awesome, but now things are getting Batsu. In Japanese, the symbol “batsu,” like the English ‘X’ is used to show something wrong. Like when you get a strike on Family Feud, that’s a batsu. For NECA, it’s a whole new way of experiencing some of your favorite characters and lines, and we’re starting with the three most popular Gears of War combatants in limited production runs (translation: get ’em while you can). The highly-stylized Batsu versions of Dom, Marcus and The Locust each stand over 5″ tall, are poseable at the neck and shoulders and designed with urban vinyl in mind. They also have the Lancer accessory, and you’ll know them when you see them because of the window box packaging. Once again, these are limited runs, which means they won’t be around forever. They hit stores next month, so make sure to keep an eye out, and of course they’ll be available online at our Amazon storefront. Keep it tuned to necaonline.com for more info on this and other lines from your favorite games and movies. Pictures of the figures are below for your viewing pleasure. 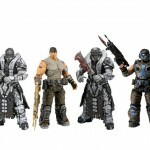 Neca has revealed their next installment of their Gears of War 2 figures, based on the popular video game for the Xbox360. Due out late July, our fourth series of figures based on the wildly popular Gears Of War 2 coincides with the release of the brand new All Fronts Collection for Xbox 360! The series features four figures from the game and of course enough firepower to blast Locust into oblivion! With interchangeable heads, Dom and Marcus each represent COG in Theron disguise from the Road To Ruin mission with improved elbow articulation and Lancer weapons that can peg into their backs, for those times when they’re not raining down destruction on the Horde. 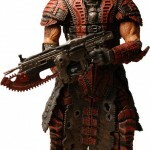 An armored Locust Grenadier Elite comes with a peggable Gnasher shotgun, and NECA’s biggest Gears Of War figure yet, the helmeted Locust Grenadier Flamethrower includes a Scorcher flamethrower and fuel tank backpack! And for anyone who can’t get enough Gears, there’s the Ticker with classic motorized “pull-back-and-go” action! The All Fronts Collection drops July 28. 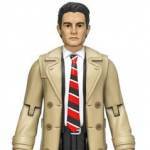 Stay tuned to NECA for more info and news on figures to come! 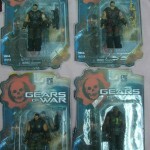 You can see images of these Gears of War 2 figures by clicking the headline of the story.